An ancient traditional Chinese saying goes: "The precious things are not pearls and jade, but the five grains". Rice was considered the first grain and has fed more people for longer than any other food in history. Long Grain Brown Rice is one of the most nutritious members of the rice family. The nutrient rich bran husk is not removed from brown rice, and the longer grain is higher in protein than short grain. 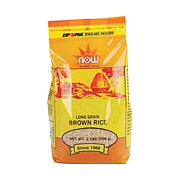 Rice Brown Long Grain Natural is shipped in a discrete, unmarked package. Orders are processed immediately and usually take about 3 to 5 working days to be received.. Any information received is used only for order processing and shipping purposes. Your information, such as e-mail address, will never be disclosed to a third party.